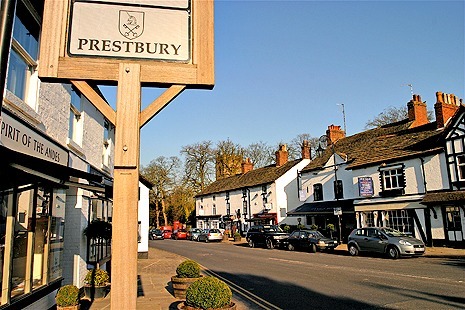 When the first buildings went down in Prestbury village is unknown, as records don't seem to stretch back that far, but it is mentioned in the Domesday book of 1086 under the name of Presteberie. The village was quite small at this time, consisting of 18 villagers, five smallholders, a priest, a riding man and 11 slaves. The village name means "Priests fortified place" and is though to be a reference to a fortified manor home which was the dominant building during the records of the Domesday book. This village is a contender for being the most haunted village in England, with only Pluckley village in Kent slipping past into first place. The exact number of ghosts haunting the village is unknown, as there is so much paranormal activity here that its hard to tell spirits apart. The most well known ghost has been named "The Black Abbot", and makes his appearance mostly around Christmas and Easter, though he has been reported throughout the year. His appearance is that of a shadowy figure, wearing a robe with a dark shadow over his face making it unable to make out any facial features. He appears to be stuck in some kind of time loop since many people have reported him doing the same thing. He has been seen coming out of the church doors and across its yard, only to walk through the wall of a cottage. The residents of the cottage say that when he arrives they never actually see him, but are often treated to the sounds of banging around in the attic. What causes these ghosts to linger will never be known as there would have been a huge number of deaths in the area over the village's 1000 year history. One of the people who is known to have died here though is that of a messenger who was killed in 1471 by a Lancastrian archer while on route to Edward 1V’s camp at Tewksbury. People have reported seeing a horseman riding down Shaw green lane early in the morning. The next most well known ghost can be found on The Burgage, which is the oldest street in the village. Though he is never seen the sounds of galloping hooves have been heard coming down the street, only to instantly stop at the same point. The story behind this one comes from the Civil war when Parliamentarian soldiers were held up in the village. They would set up traps for horses and one knight a Royalist dispatch rider, heading to Gloucester from Sudeley Castle, rode straight into the trap and was flung from his horse and executed on the spot. There are many other tales of the ghostly goings on in this village, with many of the local residents have their own stories to tell. Since it is a village it is permanently open to the public and there are various places to stay who like to play on the villages ghostly reputation.